We are no longer accepting orders for Spring Floral Tributes. Tributes may still be purchased in-person at our Greenhouse, while supplies last. Tributes ordered through the Cemetery will be placed on the grounds April 18 & 19. 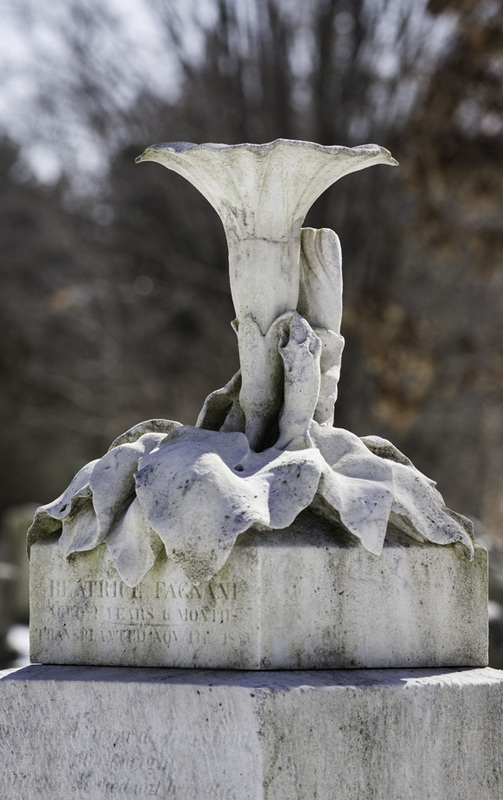 Mount Auburn’s collection of monuments and funerary art give meaning and spiritual significance to the Cemetery’s historic landscape. Dating from the early 19th century through to today, every memorial contributes to the qualities that help make the Cemetery “a site of comfort and inspiration to the bereaved and the public as a whole.” The wide-ranging diversity represented in the monuments, from contemporary flush markers to lavish Victorian sculptures, helps create the aesthetic richness and unique texture of Mount Auburn’s designed landscape. Monument commemorating Beatrice Fagnani (1855-1857) is urgently in need of repair. Preserving our historic monuments and buildings is a priority, and a challenge. 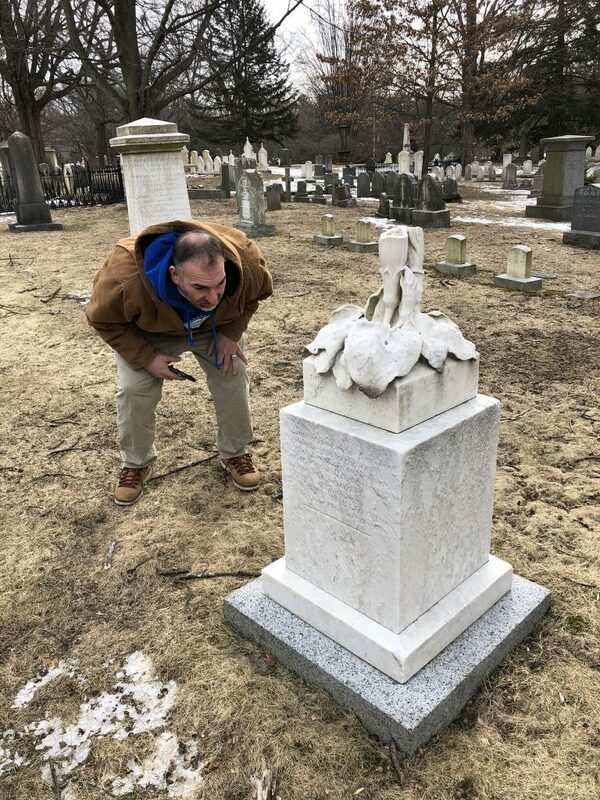 After years of exposure to New England weather, many monuments, particularly marble memorials, now require an extra level of care and maintenance to protect and stabilize them. Beginning in 2014, the Friends of Mount Auburn has been working closely with Cemetery preservation and curatorial staff on a multi-year initiative to raise funds to conserve the most significant monuments on our grounds. To date, seven significant monuments have been professionally treated by a sculpture conservator working with the Cemetery. Plans are currently underway for conservation of the Whitney and Fagnani monuments. Both memorials are urgently in need of care and conservation. Delicate morning glory sculpture commemorating Beatrice Fagnani (1855-1857). Photo by Greg Heins, 2014. The delicate morning glory sculpture commemorating Beatrice Fagnani (1855-1857) has eroded and cracked over time. The monument is urgently in need of repair and conservation as the flower has broken in half and is being carefully stored inside until repairs are possible. Carved out of Italian marble by the sculptor Patrizio Piatti in 1857, this significant monument is a tender example of Victorian iconography. The morning glory flower, with its fluted form and overlapping leaves, closes in the evening and blooms in the morning, symbolizing death and rebirth. The inscription on the small pedestal is a poem by Maria White Lowell. 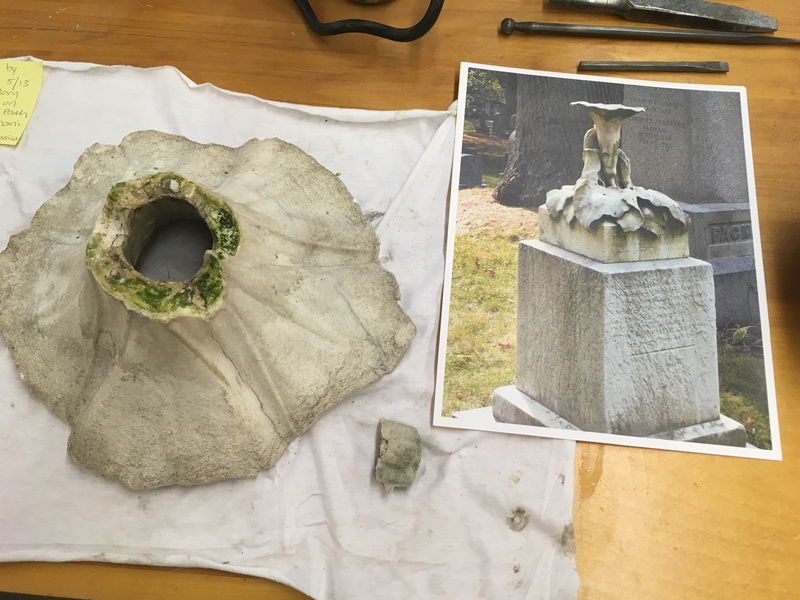 Conservation will include washing the monument, carefully re-attaching the broken flower and filling any voids or cracks, and treating the monument with a stone consolidant to slow deterioration. The dramatic Whitney Monument was commissioned by Charles Whitney (1828-1887) for his lot at Mount Auburn. Photo by Greg Heins, 2014. 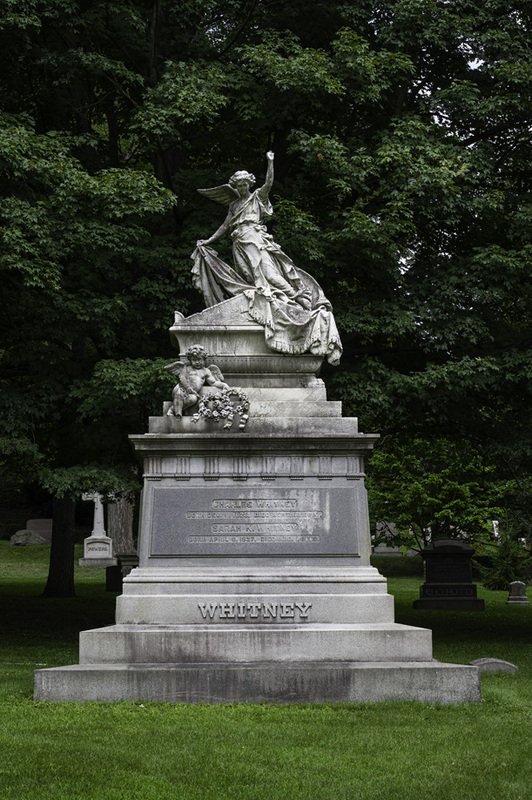 The dramatic Whitney Monument was commissioned by Charles Whitney (1828-1887) for his lot at Mount Auburn. Whitney, who operated one of the largest lumber enterprises in the United States, commissioned the sculptor Nicola Cantalamessa-Papotti to create the large, marble memorial in 1883. Putto on raised pedestal of Whitney Monument. Photo by Greg Heins, 2014. The monument depicts a magnificent angel with outstretched wings atop a large sarcophagus with a putto (a winged figure of a child) holding two floral wreaths at its base. 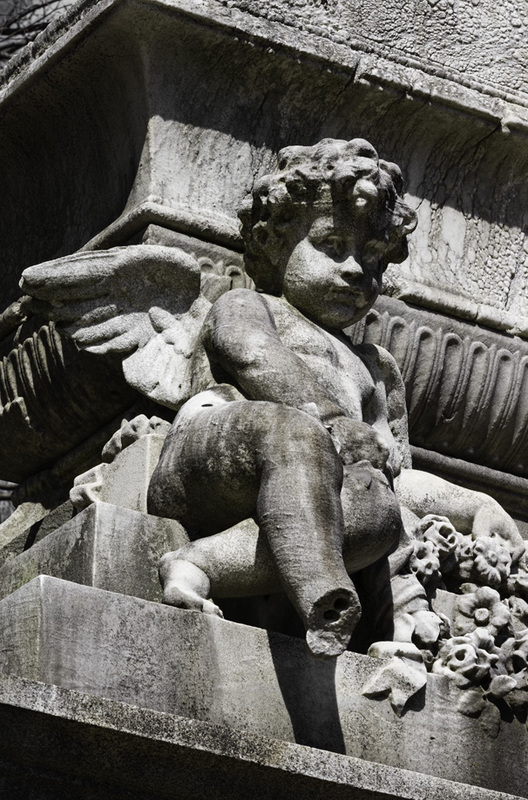 Significant losses are evident, including the large, ornate left wing of the angel and the right foot of the putto which have both been broken off. The monument also shows signs of considerable erosion, and there are cracks and fissures throughout the marble. Conservation treatment will include washing the entire surface of the monument, removing dark gypsum crusts with a handheld laser, repointing the joints in the granite stones that make up the base, filling in all cracks and voids in the marble, and applying consolidant to the marble to stabilize the surface and slow further loss. Donate today and join us in preserving our most significant monuments, please click here. Or contact Jenny Gilbert, Director of Institutional Advancement at 617-607-1970 or jgilbert@mountauburn.org.